Food at Punong Restaurant, Tagum City. Good food does not always come from top-rated Michelin star restaurants. Sometimes, you can find the best eats in unlikely places like that hole-in-the-wall eatery along a dimly-lit alley or a floating restaurant partially obscured from the road by a wall of mangrove trees. We discovered the latter on a very rainy morning on our way to Davao City from Tagum City, Davao del Norte. The rain was falling in sheets and it was simply getting too dangerous to balance the car on the slippery highway. 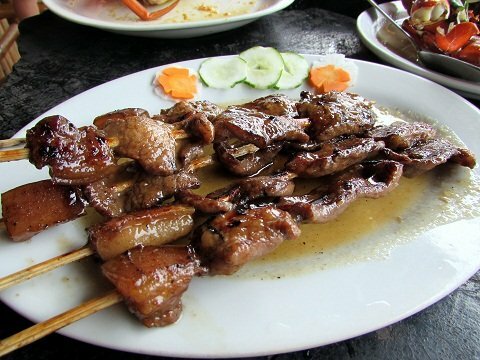 With stomachs grumbling, we decided to seek out the restaurant we saw on the way to Banana Beach Resort the day before. Punong Restaurant catches the passersby’s attention by its position behind a wall of mangrove trees. There’s something about its “hidden” location that spurs one’s curiosity. It’s located right by the bridge that crosses the Tancu-an River. The Tagum City River Cruise is just nearby; I would have wanted to go for the cruise but of course that was out of the question because of the weather. A restaurant on the water. As it turns out, Punong Restaurant is already a popular dining stop for travelers passing by the national highway going north from Davao City. I have never heard of it though; whenever we traveled this road before, I was either sleeping or my nose was buried in a book. 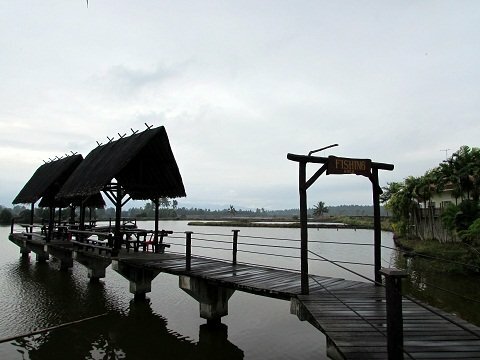 Punong Restaurant has two buildings that are both on concrete stilts to give the impression that it is floating. 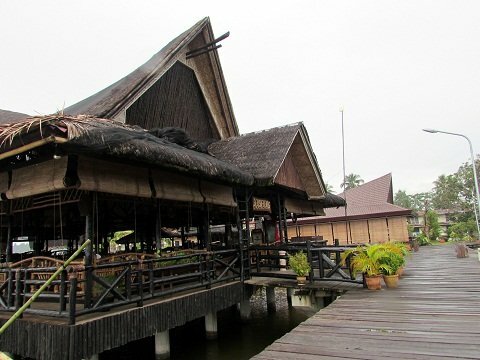 It is Malay-inspired with a thatched roof, native bamboo furnishings and high ceilings. 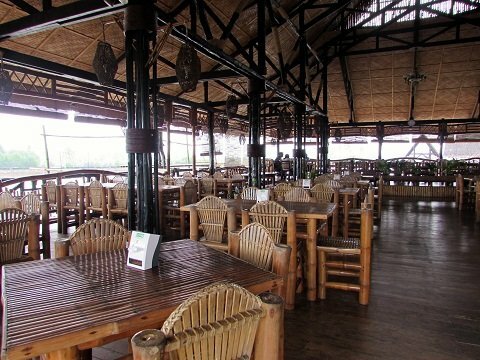 The restaurant is airy and there’s an excellent view of the fish ponds, locally called “punong” on which it is built. The restaurant’s interior is airy and native-inspired. We picked a table at the back, directly facing the Fishing Area. Yes, guests may catch some fish (tilapia and milkfish) from a designated area and have it cooked at the restaurant kitchen. The Fishing Area where tilapia and milkfish can be caught. By the time our friendly waiter took our orders, the skies has somewhat cleared and the rain has reduced itself into a drizzle. I decided to explore the boardwalk while waiting for the food and work up an appetite. 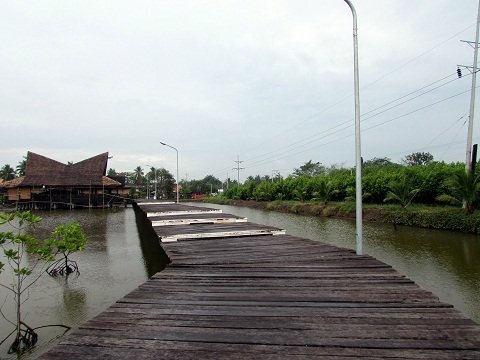 The wooden walkway covers quite a distance from Punong Restaurant until it reaches the jump-off point for the Tagum River Cruise. The boardwalk spans the distance from the restaurant to Tagum River Cruise’s jump-off point. My stroll on the boardwalk was uneventful save for when I accidentally stepped on a rotting plank and I almost lost my balance. Other than that, it was a beautiful stroll with the restaurant behind me, the river ahead, a wall of mangrove trees on my left and the fish pond on my right. I came back just in time for lunch. Punong Restaurant serves excellent Filipino classic dishes as well as a few influenced by foreign cuisines. However, their main draw is really on their seafood dishes; you can easily tell from their menu where ‘best sellers’ and ‘chef-recommended’ dishes are marked as such. 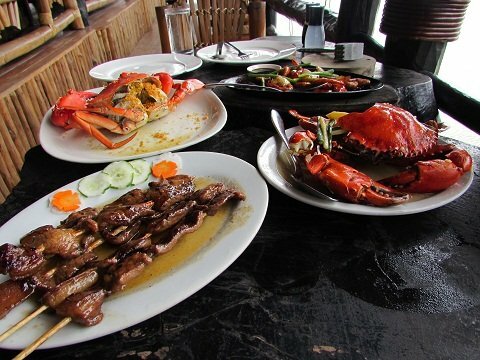 Being seafood fans, we ordered Steamed Crab, Ginataang Alimango and Gambas (prawns). We also got pork barbecue since we were traveling with a two-year-old picky eater. 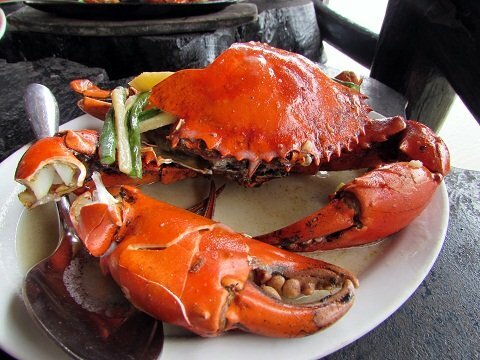 For crabs, guests are asked to choose between the male or female variety. Male crabs are larger and have more meat while females have more of the delicious, cholesterol-laden roe locally referred to as aligue. They say there is also a “bakla” (gay) variety which has the best of both worlds but it was not on offer at Punong Restaurant. They are priced per 100 grams and each typically weighs about half a kilogram so you can imagine just how big they can get. Our orders arrived along with mallets and small wooden board. 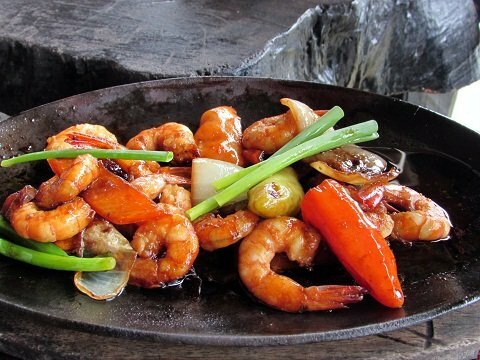 The gambas and ginataang alimango were served on sizzling plates. Steamed crab topped with fried garlic bits. Crab cooked in coconut milk (gata) and mixed with vegetables. The food was excellent! The crabs were really fresh, meaty and tasty. The prawns were cooked with just the right amount of spice and were still juicy, not rubbery like how they often turn out after being overcooked. I especially liked the ginataang alimango (crab cooked in coconut milk and mixed with some veggies); the taste of the coconut milk was not entirely overwhelming and the vegetables were actually edible and not just garnishing! I could not say much about the pork barbecue but it was okay, I guess. I can easily overlook the dryness of the meat because seafood is their specialty. 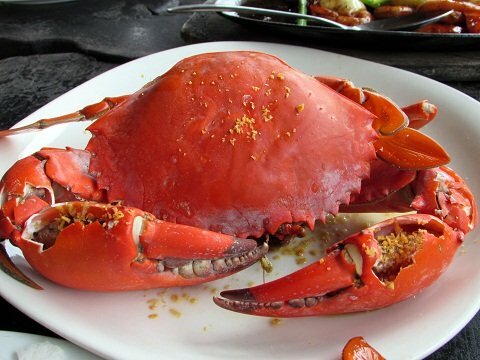 There are also other pork, poultry, beef and vegetable dishes on the menu for those who are allergic to seafood. Punong Restaurant’s prices leaning towards the expensive side but for the view and the taste, it’s definitely worth every peso. We paid P1400 for four dishes and a cup of white rice—a little too pricey for our regular dining expenses but we can’t complain. The smile on our faces and the satisfied feeling in our tummies tell us that it was money well spent.